Last night’s dinner was a combination of store cupboard ingredients and bits and bobs from the fridge, but it turned out rather tasty. Healthy and hearty, a risotto fills you up and acts as a base for such a wide variety of ingredients. 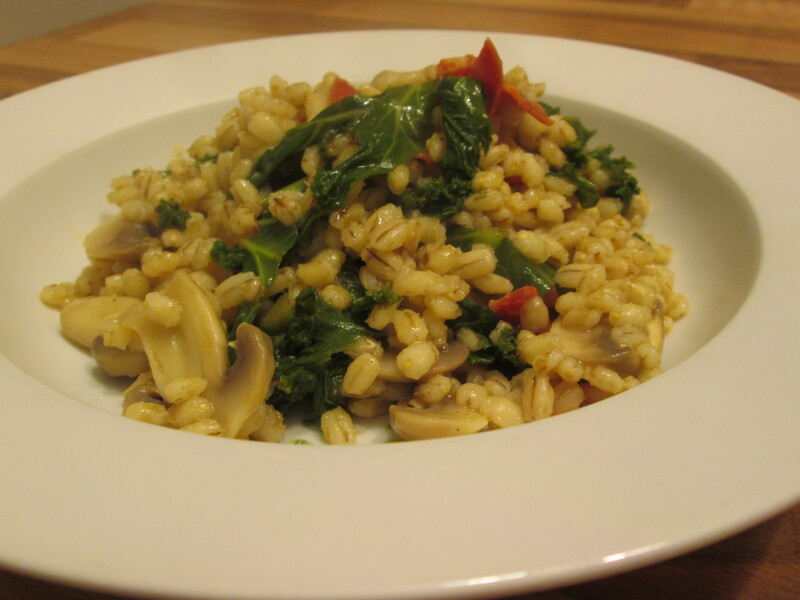 Using barley instead of risotto rice is often quicker and is much easier as you don’t have to constantly stir it. Barley also has a lower glycaemic index than rice, meaning that it won’t spike your blood sugar and cause that consequent dip. I tend to make a lot of this so I can have it for lunches later in the week so I used about 200g of barley. This should probably feed about 3 or 4. Start by rinsing the barley a couple of times in cold water. Transfer to a pan with enough boiling water to cover the barley by at least 2cm. Pop in the stock cube, stir and bring to a simmer for around 30 minutes. Slice up the mushrooms and chorizo (the amount is personal choice!) and add, along with the kale, in the last 5 minutes of cooking. You may need to add some more water throughout cooking as barley soaks up a lot, just keep an eye or ear on it, you can hear if it’s boiling dry. Add some black pepper to season at the end (you won’t need salt) and stir until all the water is soaked up. Serve up and enjoy! Posted in Good foods, Healthy eating, Recipes and tagged barley, chorizo, glycaemic index, kale, mushrooms, risotto, wheat free.